The stone churches in Lalibela are one of the destinations required if you decide to experience the Ethiopian cultural heritage. Located in the northern Ethiopian province today these rock monasteries have been described as one of the wonders of the Christian world. Built in the 12th and 13th century and standing at an altitude off 2630 m, Lalibela today is a major religious center and a famous pilgrimage site. 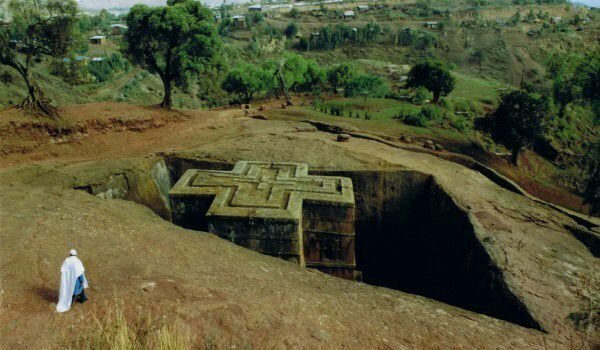 It was originally called, Rohan and was later renamed, Holy Monastery of the greatest king of the dynasty Zague Lalibela, who was a Christian. Legends also say that he received a vision of how the ruler travels to Jerusalem, with that result he decided to build his Holy Mountain in the distant mountains of his homeland. Ten churches were carved out along the river that baptized Jordan and which still bears that name. The story goes that after the death of Lalibela in 1212 his widow built the eleventh church. All these 11 churches were built in the monolithic red rock for a century. According to the legends, Alexandria and Jerusalem’s skilled stonemasons were invited together with local workers which began to seek refuge in the rocks. It is believed that the job was walking upside down because the roofs of buildings are on level ground. Highest among the monasteries is the, Temple of Christ the Savior. In this desolate and lonely place, however, the most visited is the, Shrine of Our Lady Maria. The windows of this invention are of Greek and Roman crosses. It is characterized by numerous reliefs and the central inner column is wrapped in cloth. In the past, Lalibela was reached only on foot or by mules, but today it is possible to get there by jeep. In all these centuries, churches have been preserved to this day thanks to the care of priests who kept inside the precious Christian relics.